Finding your favorite bakery in your hometown is incredibly simple: you know every landmark, crossroad, and turn on your way to an aromatic, flaky croissant with a mug of your favorite coffee. However, if you’re travelling in Paris or San Francisco, it can be harder to track down the highly regarded café you heard about on social media. This is often when a map app comes in handy. By following the app’s instructions, you can easily find your destination. Although it may not seem obvious when you are lost in a foreign city, your brain has a “map app” of its own. Within the brain, the region called the hippocampus is responsible for memory — including memory related to navigation — so it can be likened to the mobile application that aids you while travelling. Location services that track your current location are the “place cells” of the hippocampus, responsible for identifying where you are in relation to your surroundings. The total distance calculated by your app is mirrored by the “grid cells,” which similarly monitor distances to distinct locations around you. Your app’s compass icon finds a parallel in the “head-direction cells” that activate when you are looking in a certain direction. The finishing touches to the map of your current surroundings are provided by the edges of your mobile device’s screen and the “border cells” of the hippocampus, respectively. When using a map application, your focus is almost always the destination. This isn’t surprising; it’s why we say “‘X’ marks the spot” in classic vernacular. Consequently, it is interesting that research on the hippocampus and navigation has not been more focused on the goal: reaching the destination. A turning point toward more destination-based studies was recently fueled by Ayelet Sarel, Arseny Finkelstein, Liora Las, and Nachum Ulanovsky of the Weizmann Institute of Science. The team of researchers wanted to gain a deeper understanding of how navigation-related goals are mapped in the brain. “I was fascinated by the possibility that we may find neurons that could support this natural strategy of goal-directed navigation,” Sarel said. For their experiment, the researchers turned to bats for a number of reasons. The bats’ ability to fly allowed for three-dimensional observations of movement, as opposed to the two that would be possible with non-flying animals. The bats also provided some diversity to this field of research, as rodents are the most-used subjects for studies of this nature. 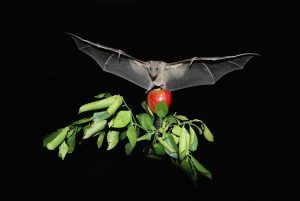 In the first stage of the experiment, Ulanovsky’s Egyptian fruit bats flew to their goal: their favorite fruit. Tracking devices, which the bats wore during the experiment, allowed for the team to monitor activity in the hippocampal cells, leading to the discovery that around twenty percent of the brain cells were encoding information related to the destination. Curious about how blocking the fruit would affect brain activity, the researchers placed a cover in front of the bats’ target. When they found that occluding the goal did not change the bats’ neural representation of the trajectory to the delicious treat, they were pleasantly surprised. The consistency in the hippocampal representation suggests that navigation is based on memory — not solely on an organism’s current ability to sense the destination by sight or smell. The Egyptian fruit bats could find their destination even when the fruit was blocked from sight. Image courtesy of Yossi Yovel. “The main surprise was to find beautiful representations of direction and distance to the goals, which fit behavioral predictions very nicely,” Sarel said. Looking ahead, the scientists at the Weizmann Institute hope to conduct similar studies in more natural conditions, as opposed to a controlled lab environment. Further, they would like to study how the neurons behave when there is more than one goal. In the meantime, the results of this study have exciting implications for Alzheimer’s disease research. There is not yet a cure for Alzheimer’s, which is characterized by memory loss and afflicts over five million Americans, but this research could provide a map for how to fight back against the disease. By better understanding the way memory is handled by the brain, scientists have a baseline that makes it easier to understand what has gone wrong in cases of dementia and serious memory loss. We’re not there yet, but with studies like this one, we’re one step closer on a journey to an important destination: a comprehensive understanding of how the brain works.